You KNOW you’re in for a treat when you can get a SINGER sewing machine that has a metal body and bedplate and other elements made from stainless steel under $200. When I saw the price of this sewing machine, I thought I was dreaming. And while this sewing machine is perfect for beginners, it’s much more than that. After all, It has Heavy Duty in the name. So what makes Singer 4432 so special and great? Like many of Singer sewing machines, 4432 boasts an old–school look so if you’re a seasoned sewer, this look will be familiar. A mechanical build of this sewing machine limits the number of features but comes with extra durability and reliability. This model will allow you to sew leather, multiple layers of denim and cotton, faux leather and more. It can really handle a lot! 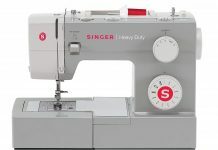 Singer 4432 features a metal frame that gives this sewing machine enough of a weight to stop it from moving around the table. Being made from metal also means that the sewing machine is much more durable and will last you a long time. Stainless steel bedplate ensures that the fabric will be fed slowly and evenly which means that your stitches will be consistent and even. Even a beginner will be able to produce professional looking sew. Top Drop-In Bobbin has a clear window so you will always see how much thread is left and plan accordingly. Not only that, but the bobbin is easy and convenient to insert and take out of its place. With three needle positions, multiple stitch adjustment controls and automatic needle threading, sewing with this sewing machine is not only super easy but also you can customize your stitch with very little restrictions. 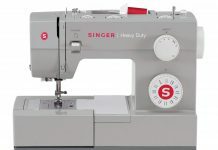 As for stitches, Singer 4432 comes with 6 essential stitches, 7 stretch stitches, 18 decorative stitches and a fully automatic 1 step buttonhole which makes making buttons a seamless experience. For sewing machine under $200, you will be getting an exceptionally powerful motor that can go up to 1,100 stitches per minute. This alone will help you finish projects that much faster AND without losing quality. Even with the speed and power, the finished seams will be professional looking and clean, even on stretchy fabrics. 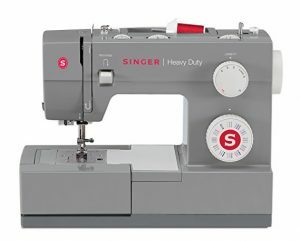 Is Singer Heavy Duty 4432 worth your time and MONEY? Not only singer 4432 is super easy to set up and start working, but its robust, reliable and friendly to beginners. With the build and quality, this sewing machine has, it’s truly a wonder that this sewing machine is so inexpensive! If you’re a beginner, this is a great tool to jumpstart your hobby or career!